From sleeping under the stars to the daily commute, life’s all about journeys. And you can make a special someone’s trip easier with a Halfords e-gift card. Whether they’re a keen cyclist or crave the latest in-car technology, our gift range lets you give them exactly what they want, no fuss, no hassle. 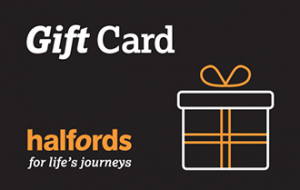 All our e-gift cards are redeemable in any Halfords store where we’ve thousands of great value motoring, cycling and leisure products to choose from. So why not give them a gift that’ll really get them going – with the Halfords e-gift range.